And it’s body engineers have achieved two essentially contradictory aims: in terms of torsional stiffness, the S-Class Cabriolet even attains values on a par with those of the S-ClassCoupé which was superseded last year, while at the same time the bodyshell weight of the current closed sister model has been maintained. With a Cd value of 0.29, aerodynamics world champion Mercedes-Benz sets a new benchmark in this segment with the S-Class Cabriolet. Enhanced Design and climate comfort. 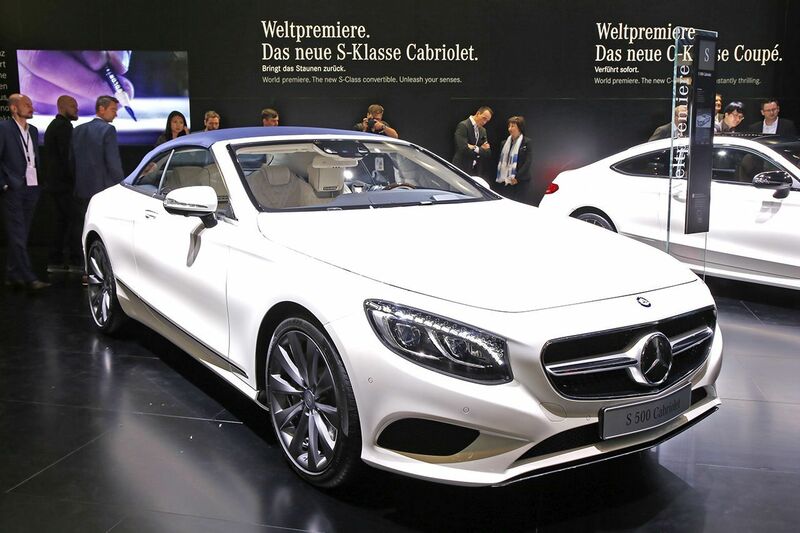 Mercedes-Benz lays claim to building the world’s most comfortable convertible. 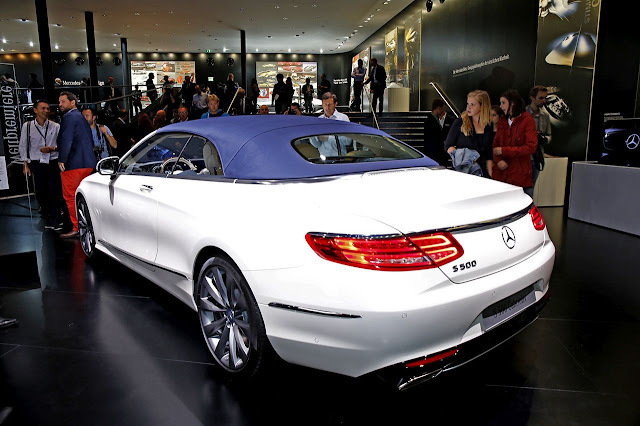 When it comes to climate comfort, numerous features ensure that this is indeed the case – the enhanced automatic wind protection system AIRCAP, the AIRSCARF neck-level heating system, the heated armrests, the seat heating also in the rear plus the intelligent climate control, which is premiered in the new S-Class Cabriolet and which in future will provide for ideal climate comfort coupled with maximum user-friendliness in all open-top vehicles from Mercedes-Benz. In contrast to conventional systems, the climate is controlled fully automatically. The rear end underscores the impression of width with flat LED tail lights and muscular shoulders. The closed soft top with glass window blends harmoniously into the rear view. The soft top compartment lid is framed by a wide chrome trim element. The rear bumper with diffusor-look lower section, two visible tailpipe trims and a horizontal chrome trim element add a sporty finish. 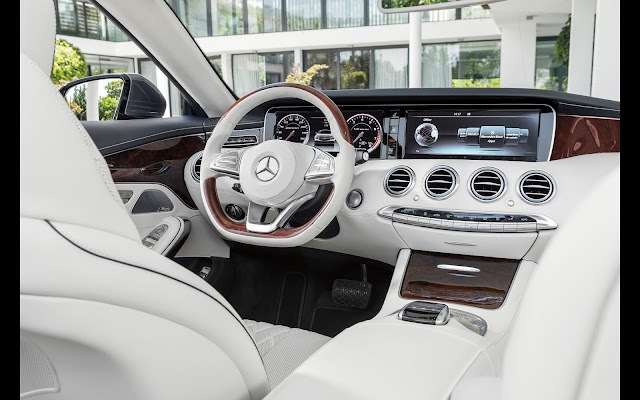 Inside, the S-Class Cabriolet boasts a luxuriously sporty design idiom and fine materials, conjuring up an exceptionally classy interior setting. The soft top opens up to create an open-air lounge that exudes a yacht-like atmosphere. The carefully matched choice of colours and materials and the high-quality controls in real metal or in chrome look underscore the vehicle's highly exclusive character. combined CO₂ emissions: 212-199 g/km. 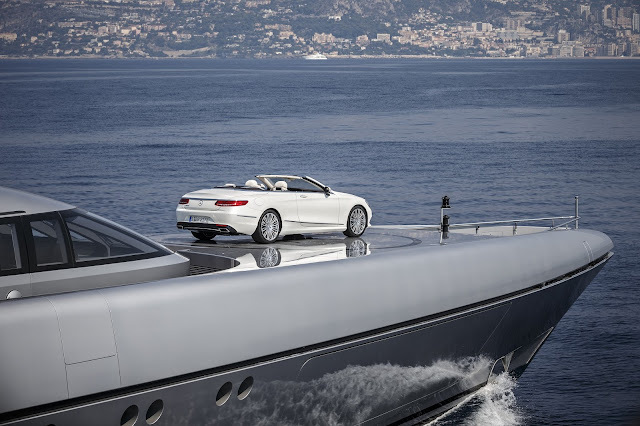 Like the S-Class Saloon and Coupé, the new Cabriolet is available with numerous new assistance systems that make driving even more comfortable and safer. Intelligent Drive systems include PRE-SAFE Brake with pedestrian detection, DISTRONIC PLUS with Steering Assist and Stop&Go Pilot, Brake Assist BAS PLUS with Cross-Traffic Assist, Active Lane Keeping Assist, Adaptive Highbeam Assist Plus and Night View Assist Plus. In addition to a distance and collision warning function in conjunction with Adaptive Brake Assist, which offers collision protection from speeds as low as 7 km/h, the COLLISION PREVENTION ASSIST PLUS system installed in even the standard vehicle also features an additional function: when a danger of collision persists and the driver fails to respond, the system is able to carry out self-governing braking at speeds of up to more than 100 km/h, thereby reducing the severity of collisions with slower or stopping vehicles. At speeds of up to around 50 km/h, the system also brakes in response to stationary vehicles and is able to prevent rear-end collisions at up to around 40 km/h. The PRE-SAFE preventive occupant protection system has been upgraded to PRE-SAFE PLUS. PRE-SAFE PLUS can recognise an imminent rear-end collision and warn following traffic by flashing the rear hazard warning lights at a high frequency. When a danger of collision persists, the system can “lock” the brakes of the stationary vehicle prior to a rear-end collision and activate the PRE-SAFE belt tensioners immediately before impact. This action minimises the risk of whiplash injury by reducing the forwards jolt caused by the impact and ensuring that the occupants are in the best possible position. On detecting an impending danger of the vehicle rolling over, the airbag control unit sends a corresponding signal to the standard-fit roll over protection system. This is quickly extended behind the rear head restraints, helping to maintain a safe passenger compartment. The roll bars are extended not by spring force, but – for the first time in a Mercedes-Benz – by pyrotechnical means, using a gas generator.